Yes, I am on Pinterest. I know you probably get asked that all the time, too. I try not to make it a time-waster in my life but I often find it to be a good time-filler while I wait for TV commercials or waiting for slumber to attack me at night. This recipe is one that my friend Gina pinned so I repinned and decided to beat her to making it. I followed the source back to “Recipe Critic” who said she altered the recipe from Taste of Home. I continued the trail to find that Joanie Shawhan made it and was a contest winner. You go girl! The “Recipe Critic” said this recipe was “insanely delicious” and that I will make it “again and again.” Not sure I like that review since I don’t want to go crazy from just one taste of this magical soup and I like variety so I don’t also want to be OCD and begin making this soup over and over. Nevertheless, I took the risk and made the soup tonight. I needed something to take for my lunches this week so I had hopes of a successful venture. In a large saucepan over medium heat, cook and crumble beef until no longer pink; drain and set aside. In same saucepan, melt 1 tablespoon butter over medium heat. Saute onion, carrots, celery, basil and parsley until tender, about 10 minutes. Add potatoes, beef and broth; bring to a boil. Reduce heat; simmer, covered, until potatoes are tender, 10-12 minutes. Meanwhile, in a small skillet, melt remaining butter. Add flour; cook and stir until bubbly, 3-5 minutes. Add to soup; bring to a boil. Cook and stir 2 minutes. Reduce heat to low. 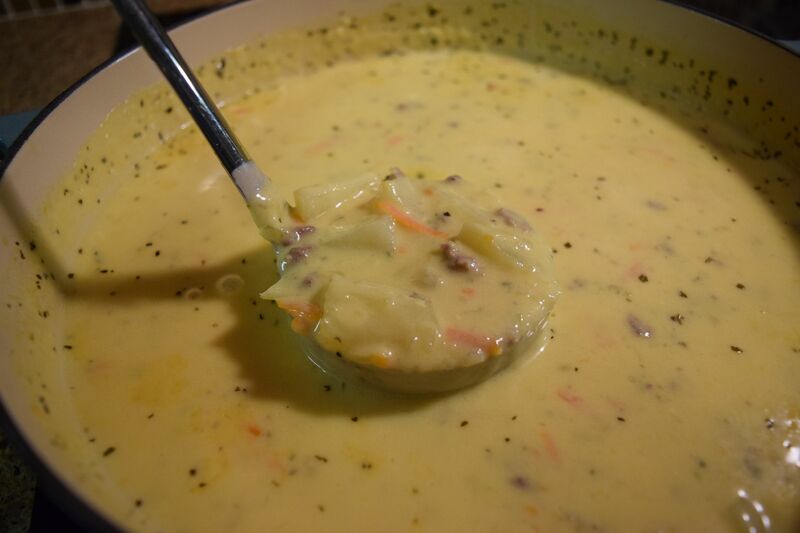 Stir in cheese, milk, salt and pepper; cook until cheese melts. Remove from heat; blend in sour cream. Yield: 8 servings (2-1/4 quarts). And now, since I beat Gina to making this soup, it looks like I’m going to have to beat her to the treadmill. I went on the Taste of Home website to find that this soup has 450 calories PER CUP!!!!!!! And 27 grams of fat per cup!!!!!!! Now I have a giant vat of it and I will have to run about 100 miles every time I eat some!!!!!!! It was tasty though and I believe my sanity is intact. Hurray for the little things in life. Looks delicious! 1 cup isn’t much soup. Better grease up that treadmill – it’s gonna get a lot of use this week!! I ended up putting most of it in the freezer but did eat a few for lunch last week. It holds up pretty well from the freezer other than I think I should have made the potatoes a little smaller. Sometimes frozen potatoes can get a little soggy which was the case here but next time I’ll know better. It would be fun to make this soup again but make it a little lighter if possible.